Ruff Day? Office Pets to the Rescue! Home / Blog / Ruff Day? Office Pets to the Rescue! 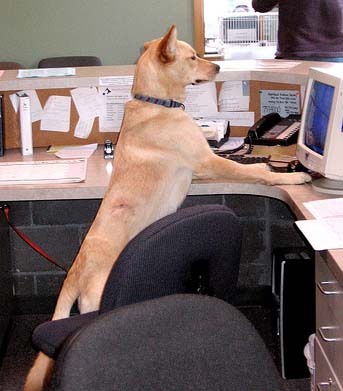 Office Pets have no fear, Take Your Dog to Work Day ( TYDTWDay ) is coming up soon! The Pet Sitters International group (PSI) started an informal holiday for this purpose which will next take place on Friday, June 20th, 2014. PSI created TYDTWDay as a platform for pet adoptions and encouraging pet lovers to mix a little business and pleasure. Additionally, various studies have been conducted to investigate whether office pets increase productivity & improve moods & stress levels in professional environments. While the office pets community is still in its infancy, gradually more companies are beginning to adopt office pet friendly policies. Pet Sitters International (PSI) created Take Your Dog To Work Day® (TYDTWDay®) in 1999. PSI created the day to celebrate the great companions dogs make and encourage their adoptions from local shelters, rescue groups and humane societies. TYDTWDay® encourages employers to experience the joy of pets in the workplace on this special day and support their local pet community. It is an annual event and is always celebrated on the Friday following Father’s Day. For cat lovers and others who cannot participate on TYDTWDay®, the entire week leading up to the day is Take Your Pet To Work Week™. In the last 12 months, 1.4 million people, approximately 3% of dog owners took their pets to the office in the last 12 months, which was only 1% higher than it was six years ago (APPA Survey, 2010). The Centers for Disease Control and Prevention cites dozens of animal experts who report that pets can decrease blood pressure and cholesterol levels as well as increase opportunities for exercise and socialization. SEND YOUR PET PICTURES TO D2 OFFICE FURNITURE! Office pets, specifically dogs, should be kept on leashes, unless in the employee’s office or cubicle. Even the best-behaved dogs may not understand that not everyone loves puppy kisses or pouncing pooches. Respect co-workers’ space. Co-workers who want to embrace your office pet will likely come to you. Employees should use baby gates to prevent pets from leaving their offices or cubicles unsupervised. In the middle of an important sales call or during a visit from a business partner is not the best time for Spot to dash out of your office. Specific areas, such as bathrooms or employee dining halls, should be designated as office pet-free. Even on TYDTWDay, there will be limitations to where your dog can roam. Work with management and co-workers to decide which areas will be pet-free. Have a back-up plan for taking the pet home if they are not comfortable in the work environment. While many pets enjoy a day spent at the office, your pet might not necessarily be ready to enter the workforce (as many may remember feeling as a post-graduate). Thus, you should have a back-up plan, such as a spouse, friend or professional pet sitter who can take care of your pet if he needs to leave the office. Should You Have an Employee Pets Policy? Celebrating Take Your Dog to Work Day!